anilum is an interactive user-generated art installation and searchable web site that collects images and information about animals who have died. By contributing photographs and information about animals that they have known or who have touched their lives, viewers become part of an online community celebrating the lives and mourning the loss of the animals that are important to us. In its gallery installation form, anilum allows viewers to first contribute entries about animals who have died. Then, in the gallery space in real time, viewers can interactively scroll through the wall-sized projected entries using the same motion that they would to pet or stroke an animal’s fur. anilum invites the contribution of the names of companions animals, but also asks viewers to consider and remember the “unnamed” animals that populate our lives including wildlife, factory farmed animals, road-killed animals, zoo animals, working or farm animals, or animal species who are endangered or extinct. A collaborative venture: anilum started as a way to allow viewers to consider important issues surrounding animal death without immediately alienating them from this potentially difficult subject matter. anilum hopes to open rather than shut the door to further productive conversations about non-human/human animal interactions. In the process of curating the Remembering Animals exhibition, Julia Schlosser envisioned a way for viewers to navigate the gallery space, holding their mobile phones flickering with an image of a lit candle, as they viewed potentially difficult images of dead animals. She was familiar with the user-generated installations designed by Joe Bautista, a graphic design professor at CSUN and the director of VISCOM, CSUN’s on-campus, student-run creative agency. Coincidence often plays an unexpected role in collaborative ventures. The night before Julia and Joe’s first meeting to discuss the development of anilum, Joe’s beloved German Sheppard Logan died. Logan’s passing provided a context for the design of anilum and he is remembered with much love. anilum was developed with the participation of the students of VISCOM. 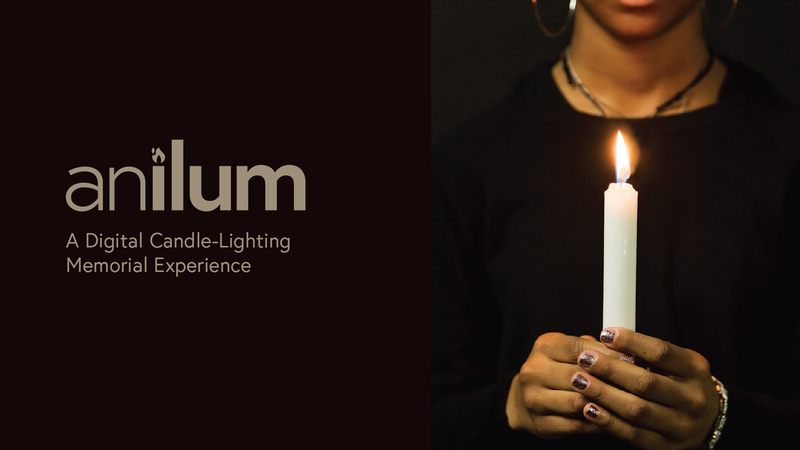 They provided continual feedback on all aspects of anilum, 10 Candles (Julia’s videotaped candle lighting ceremony) and So we lit a candle (gallery installation) including design, copy editing, videography, still photography and performance participation. Developer Trevor Greenleaf designed the interactive component of anilum in a whirlwind of creative activity. We took our name from two words: “an” from animal and “ilum” from illuminate. By combining these two words we hope to evoke a sense of commemoration for animals that were important in our lives and who we wish to remember with reverence. By lighting a metaphoric candle for an animal that you chose, you join our online community. anilum is a searchable website and an on-going, multi-locational interactive art piece. 10 Candles from Julia Schlosser on Vimeo.